The Clock Gallery, Inc. features a wide selection of grandfather, wall, mantel, cuckoo, rhythm and novelty clocks. We are proud to display the most popular time pieces by Howard Miller, Bulova, Hermle, Rhythm and Ridgeway. The Clock Gallery, Inc. has been located in Duluth, Georgia, for 26 years. We do repairs to all types of clocks and can arrange house calls for your grandfather clock. Estimates on repairs are free at our service center, and our hours are Tuesday through Friday from 10:00 am to 6:00 pm and Saturday 10:00 am to 3:00 pm. Jae Martin has 29 years of experience working with clocks. He has been a member of the National Association of Watch and Clock Collectors for 26 years. At Clock Gallery, Inc. we offer appraisals as well as moving services. 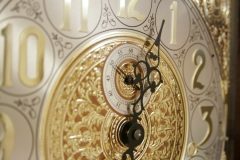 We want to make sure your clock is properly taken care of during a relocation. Please contact us for quotes at info@clockgalleryinc.com or 770-813-8140. Our new showroom and service center.